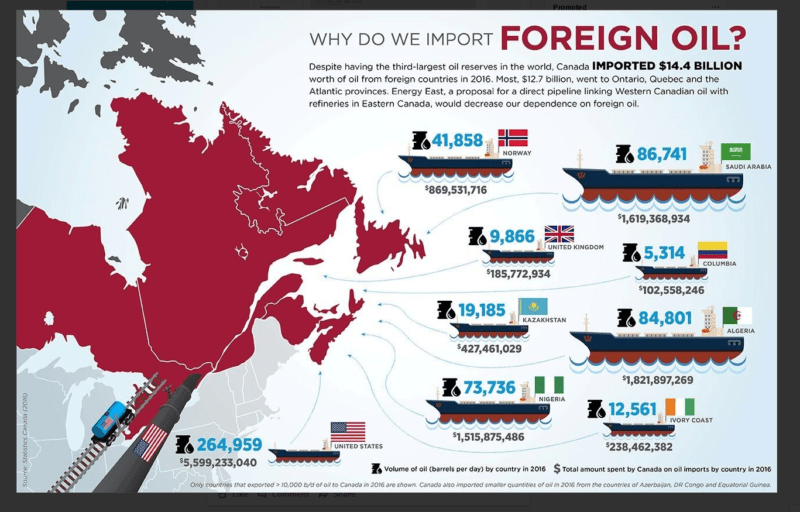 I think it is insane for Canada to be importing foreign oil. Reviving Energy East Pipeline makes sense to me. FREDERICTON — New Brunswick’s new premier is trying to revive the Energy East pipeline — even though the original proponent says the project is dead. Canada’s eastern refineries are not designed for the heavy, high-sulfur crude of western Canada. The imports will continue. “A new line could be built from Montreal to Saint John. One East Coast refinery, the Irving Refinery of Saint John, is the largest refinery in Canada and the largest refinery on the East Coast. It is capable of using heavy oil at the present time and with the addition of a coker could process raw bitumen into synthetic crude oil.” he wrote in the Financial Post. Carolyn Van der Veen, director of public affairs for Irving Oil, said it could possibly be done. $15.7 billion is an absurd amount to spend to supply one refinery that doesn’t even have a coker. Heavy crudes are more efficiently supplied from Mexico by ship.